An introduction to Pāli grammar for beginners, based on the principle of teaching grammar through composition using a gradually expanding vocabulary. Exercises requiring translation from and into Pāli form an integral part of each lesson. 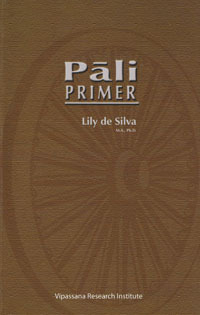 Thirty-two lessons in Pāli compiled by Lily de Silva, published by Vipassana Research Institute. For answers to the exercises, and a list of errors occurring in the Pāli Primer with corrections, see the Key to Pāli Primer. The Pāli Primer is designed as a convenient stepping stone to more advanced works such as A.K. Warder's Introduction to Pāli. Great way to learn Pali. Easy to use primer on Pali. Logical and thorough presentation. Explains all grammar, such as case endings, in a simple and straightforward way. Excellent for the beginner.